How does Google algorithm Hummingbird think? 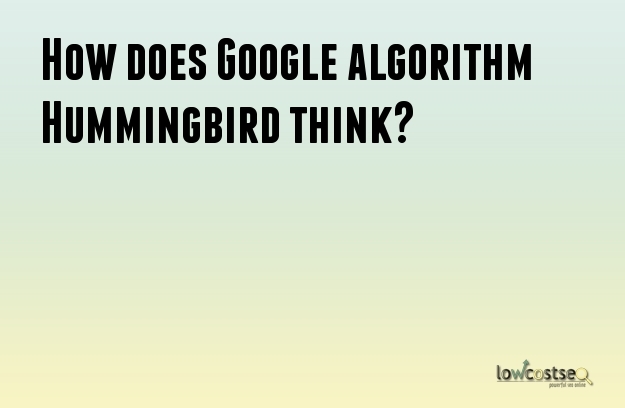 How do Google algorithm Hummingbird thinks? Semantic search is a technique where information is searched and retrieved based on the meaning the phrases or words searched. In this case, the content may not be always relevant to what users might be expecting to read. But Google has integrated semantic search along with other techniques to index the pages in a way that serves the searchers the best. There will be many other improvements done by Google in this area in the coming years. Today Hummingbird relies on query intention by taking the key elements such as requirements of the searcher and context of search into account. These key elements can be time of search, type of device used, stats on similar searches performed by the device and others. By using such information, Google tries to recognize the search habits of the users and makes quick judgments to display relevant content. While Google is making improvements in its search algorithms, websites have to post quality content for their users. Today the internet savvy terms, target keywords, and keyword density are of less importance. The way of doing SEO needs to evolve based on the changes make by Google in its Algorithms. Web content is categorized into three, text, images and video. Keeping all the three in mind, SEO experts should work on creating a theme for their website. The information in the Knowledge Graph of a company is also used in ranking the websites. This is usually relevant to the brands and companies that are well established in their business. But one must also have their eye upon local searches as it is likely to affect the search engine rankings. People making searches through portable devices such as tablets and mobile phones are increasing. A portion of these searches is done by voice search. Hummingbird in this case determines the semantics of the search by taking details such as device type, location, and intent of the query to provide relevant results. The voice-based searches are usually questions asked with long variable phrases. Hope this gives you an idea on how the latest Google algorithm, Hummingbird works to serve its users.